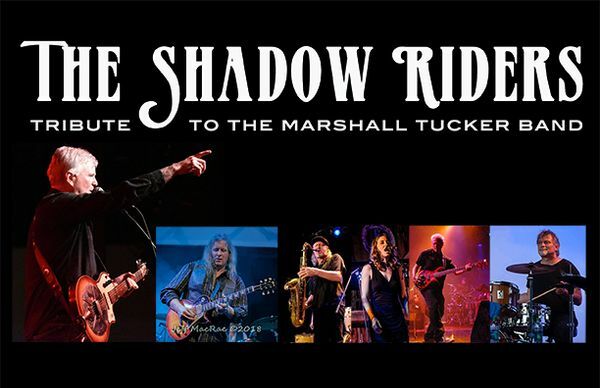 The idea behind the Shadow Riders took root when guitarists Bruce Marshall and Chuck Farrell joined forces and formed a band in 2014. With a shared love of Southern Rock and the Blues they decided to do some shows performing the music of the Marshall Tucker Band, one of the top groups in the US in their heyday. Of particular note is the fact that lead vocalist Bruce Marshall played with Toy Caldwell, the founder, lead guitarist and primary songwriter of the original Marshall Tucker Band, in ’89 and ’90, shortly after Caldwell left the original group. This gives the band a unique insight on the music and how it was played, recorded and sold to the public. The Shadow Riders is a name Toy Caldwell used for his backing group for a time and the title of one of his songs. Along with a new stellar 6 piece ensemble, the Shadow Riders perform hits like “Can’t You See’, “Heard it in a Love Song” and “Fire on the Mountain.” You’ll hear other popular tunes like “Take the Highway”, “This Ol Cowboy”, “Blue Ridge Mountain Sky” and some “deep cuts” as well. Marshall Tucker were known for their innovative melding of Country Blues, Southern Rock, Western Swing and Jazz. The Shadow Riders enthusiasm for this music is infectious, the stage show is engaging as they pay tribute to an iconic American Group.